I've been getting ready for a little shin ding at the Beach House this evening and in an attempt to move the crowds away from the island bench, I have laid a blue and white table.....lucky table. Mr Beach House couldn't care less where we have it. He said this morning, "Lets do it outside" and we probably will, but for now the table is set up within the security of the dry dining room. I used to be a climate change sceptic, but with this being the weirdest Summer of three weird Summers in a row, I am now persuaded the scientists might just be onto something, Felt like we had temps as cold as July here in Sydney on Monday. We haven't had a burning hot Summer in Sydney now for the third year on the trot and I am a little worried. But I am not here to talk about climate change. I am here to talk about other things a little closer to my heart. You may remember some of my friends on my personal facebook account and on this blog for that matter, were anti my Christmas ladder. Well some of them have been invited over to meet her in person this evening. Doubt I'll be able to convince the traditionalists amongst them, but as an only child, I am used to going it alone and being a voice in the wilderness. I embrace it actually. I love her and although apart from the advent calendar, it doesn't really look a bit like Christmas round here at the moment, I am happy with that for a change. I am going to do a mantel this weekend, so we shall see if we can't make it a little more Christmasy by Monday. So with my table here, I have my new tablecloth. Declaring here that Jen from Coast and Country Homewares sent it over as a thank you for the giveaway I recently ran for her. I chose the pattern and I have to say I absolutely love it. How sweet that girl is. Everything else is from my garden or cupboard. 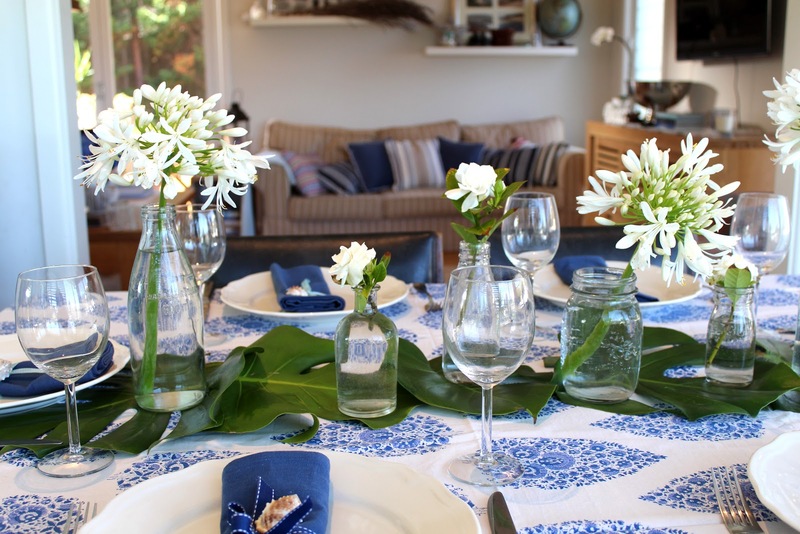 The table runner is just some elephant ears, which were growing under the house. 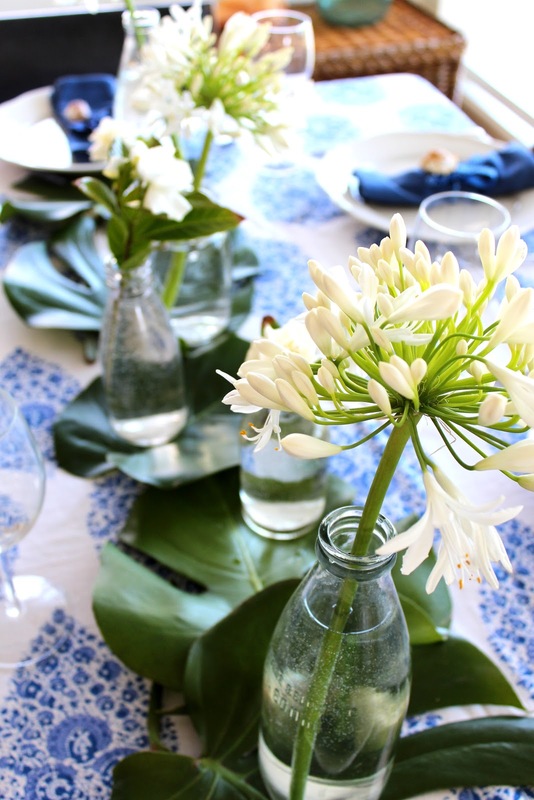 Gardenias and agapanthus shoved in old bottles. 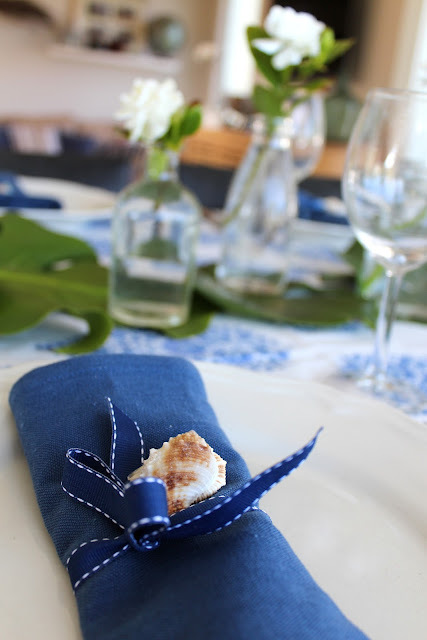 Napkins from a sale I bought ages ago, tied with variant ribbon and a little shell popped in the middle for some coastal zing. Like most of you guys, the budget here is as tight as the proverbial fish's whatsit at this time of year and with the 2 men of the house both born on the same date next week and a wedding anniversary a few days later (what the hell were we thinking? ), we are financially full on here. Preheat oven to 180C/375F place eggplant onto lined baking trays and spray with olive oil and lightly salt. This step can be done the day before to save time. Bake for 30-40 minutes until it is soft. You could also fry this, but baking cuts down on the fat content. Place a pan over a moderate heat add oil, tomatoes cumin and toss together for a minute. 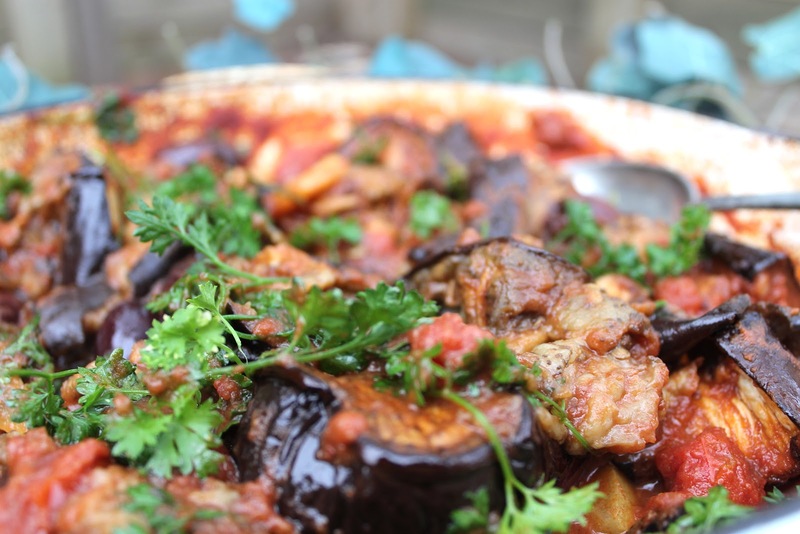 Add eggplant, preserved lemon and half the lemon juice and parsley. Stir to combine until eggplant is warmed through. Serve warm or at room temperature dressed with the reserved lemon juice. For dessert we are having Strawberries in Mascarpone on Meringue Birds Nests. A relatively simple menu don't you think, washed down with a few bubbles and my standard rose. If I don't forget to shoot the birds' nests, I shall post the recipe. 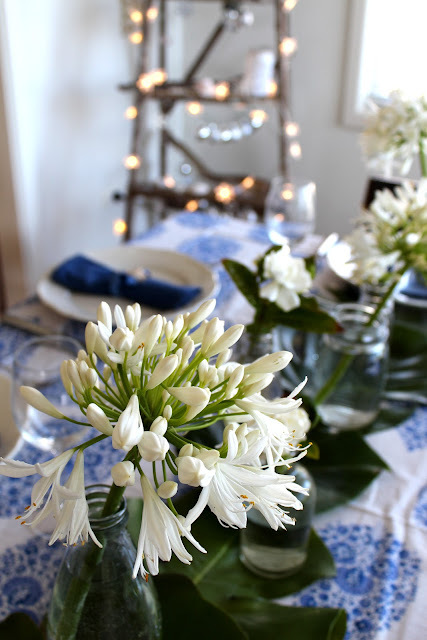 For more tablescape inspiration go here. And to the lovely people that leave comments here. I have switched on 'comment moderator' as I am being spammed. What tossers those SEO junkies are!!!!!! love that tablecloth & the white flowers! I have found I fixed the spammers by switching to registered users mode without having to put the moderator back on. 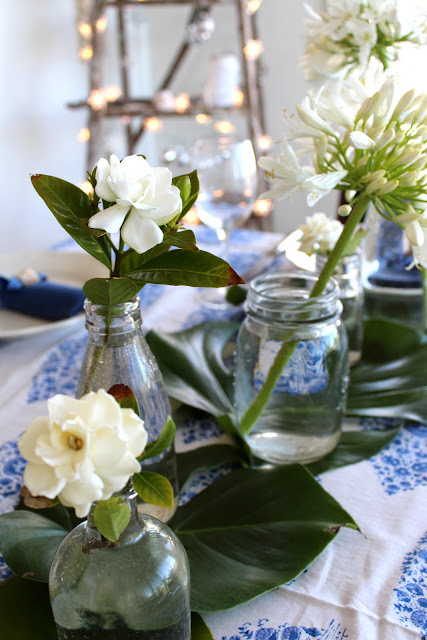 Gorgeous table setting, I am so going to copy! Go right ahead Karen. It's the best form of flattery. Your table looks lovely! It sounds like you have a lovely evening planned! We're pretty luck with dates in our family - Mr. R's birthday is in March, son is in May, anniversary is August, and my birthday is November. I still haven't decorated for Christmas - I've been incredibly busy at work, but I have the next 5 days off, so it might start to look a little festive around here in the next couple of days. Here's hoping! 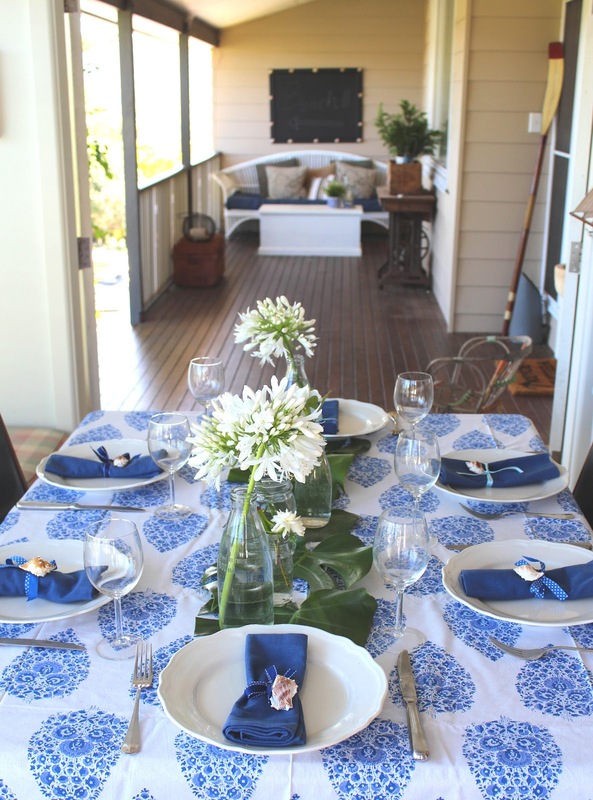 That looks glorious - such a pretty setting and that tablecloth is just divine. PS I can't believe you aren't a Christmas card sender - I was relying on you! Shall I keep the one I was going to post to you today then? NO do send it. I think a card from you would be divine because you are all about style and I want to read your message. Hope I didn't offend you. I never expected you would send me one. Such a clean, fresh look... Love it. The eggplant salad looks good. I'm a huge eggplant fan. Blue and white are my favourite colours, I always love the combnation of those two colours. Awesome decorations. 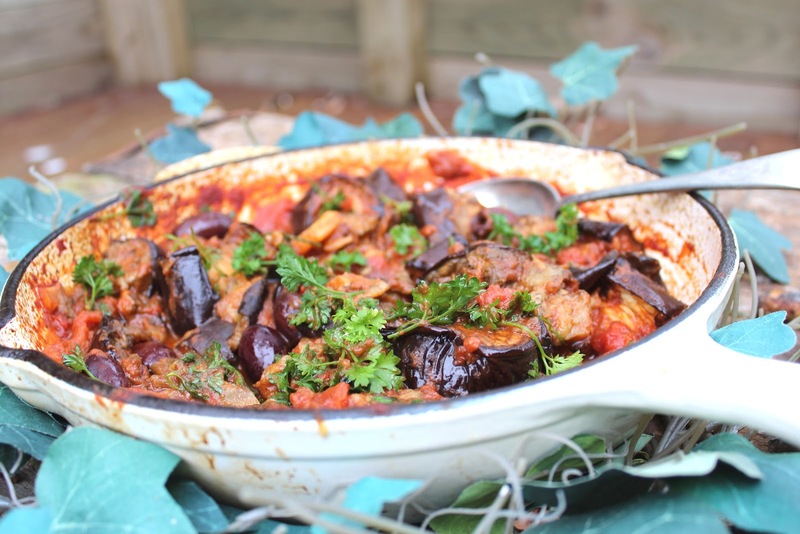 This looks absolutely delicious - I love a good eggplant recipe. When done well, it is a favourite vegetable. can i come?? ?...im housetrained and i LOVE your ladder! A pox on that silly husband of mine who won't eay eggplant. What's wrong with the man! I'll have to try this just for me and the big kids sometime. The table looks groegous, love the blue and white tablecloth. OMG Carolyn. Just give me the dish, a slab of crusty bread and about 30 minutes. That looks divine! 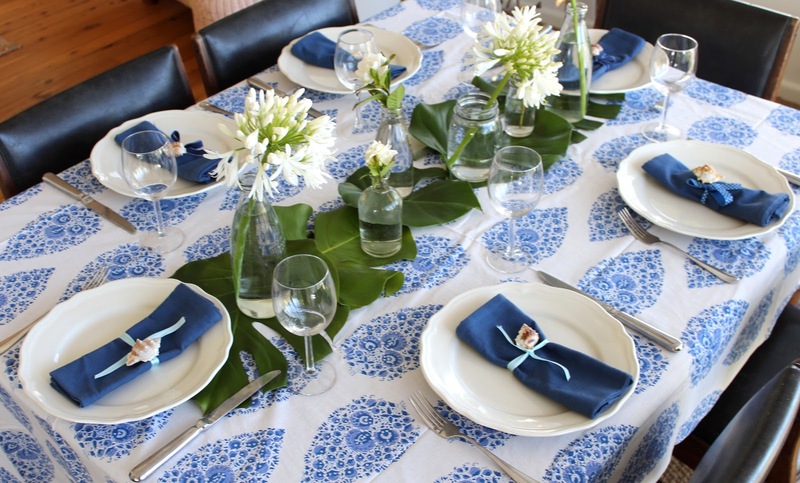 Love blue and white table settings. Must give the eggplant salad a go too.